Obtaining a visa can be a good way to come to America, but visas generally come with an expiration date. 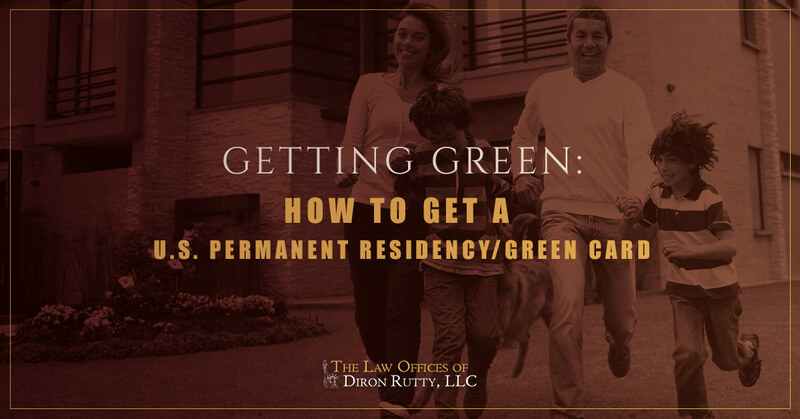 If you want to become a permanent resident of the United States, the first step toward becoming a citizen is to obtain a United States Lawful Residency Card — what is commonly referred to as a Green Card. After living in the U.S. for a number of years with a Green Card, you may become eligible to become a naturalized citizen. Start by learning more in the steps below, then contact the Law Office of Diron Rutty, LLC in the Bronx, Manhattan, or Poughkeepsie for experienced help navigating the immigration process. The categories just mentioned are pretty broad and can encompass a number of different skills and abilities. You will want to explore the US Citizenship and Immigration Services website or work with an immigration lawyer to determine if you are eligible to apply and which category you will fall into. Before you can file for the Green Card itself, you will need to file an immigrant petition. Some petition options require someone else to file for you, while some you can file yourself. For example, if you are coming to the U.S. for a job, your employer will likely have to file the immigrant petition for you. Or, if you are trying to immigrate as family, your family member will have to file for you. Likewise, if you are coming as an investor, a business partner or agency may have to apply on your behalf. If you are an individual with special abilities, advanced education or training, or you were granted a National Interest Waiver, you can file the immigrant petition for yourself. Once the immigrant petition is approved and there is a visa available in your category, you will then have to file the Green Card application. After that, you will go to a biometrics appointment — during which you will be fingerprinted, photos will be taken, and they will record your signature. Finally, there will be an interview. After all of this, you will receive a decision on your application. As you may imagine, going through that process without immigration help can be daunting. Contact the Law Office of Diron Rutty, LLC to work with an immigration lawyer to get the help you need.